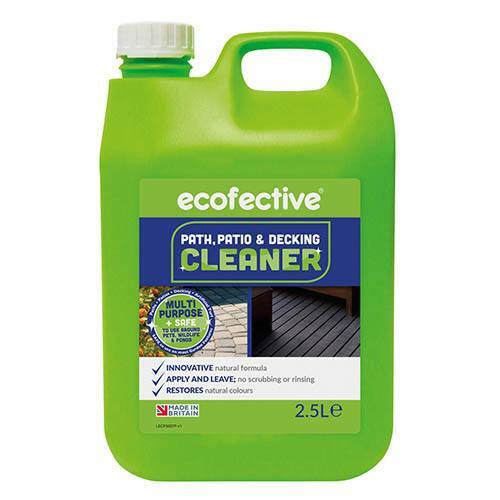 Path, Patio & Decking Cleaner is designed to clean moss, algae and everyday dirt away from the affected areas. It is safe to use on most outdoor surfaces including stone, concrete, brickwork, decking, wood, plastic, garden furniture, glass, paintwork, outdoor fabrics and much more. Fast acting the cleaner can be applied by a sprayer or brush and left; no scrubbing or rinsing is required and results can be seen after just 24 hours*. Coverage is up to 80sq.m and the formula is safe to use around pets, wildlife and ponds. *Dependant on weather conditions at time of application. Around the home: patios, decking, conservatories – glass or plastic, roofs – felt and slate, outside walls both painted or not. Sports & public areas: all weather courts, AstroTurf, artificial Grass, hard play areas, access ramps, kennels, car parks. It is recommended that a spot test is done beforehand on coloured paving and other surfaces not listed above. Dilute up to 3 parts water with 1 part Path, Patio & Decking Cleaner. Mix in a low pressure sprayer and apply over the area to be cleaned. Alternatively, mix in a bucket and apply with a soft brush. Ensure an even spread over the surface. Leave product to work – and within a week or so the treated surface will start to clear, and will continue its cleaning process over the next few months.